The SX-2933 (formerly PocketPro 100S) multiprotocol print server is ideal for connecting any parallel printer to a 10baseT/100baseTX network. It is designed for Enterprise Printer Connectivity environments, but is also a cost-effective solution for SMB (Small Medium Business) and SOHO (Small Office Home Office) applications. The SX-2933 is very easy to use, and is suitable for any application that requires reliability, performance, manageability and great support. It provides flexible printer placement and it works with all popular computers and network operating systems. The SX-2933 is based on field-proven Silex print server technology that is used at major customer sites throughout the world. The SX-2933 is printer independent, allowing you to connect any parallel printer to the network. This gives you the flexibility to implement printers that meet your needs without being concerned about network print services. In addition, you can print simultaneously from multiple network protocols, providing the performance, flexibility and convenience required in today's diverse network printing environments. If your application requires high levels of security, the SX-2933 is the industry's best solution for secure network printing. It is one of the very few print servers that supports the 802.1X authentication protocol, including EAP-TLS, EAP-TTLS, EAP-FAST, PEAP, and LEAP. It also lets you encrypt your printing jobs using Triple DES, AES, or Twofish via a Windows-compatible port monitor. 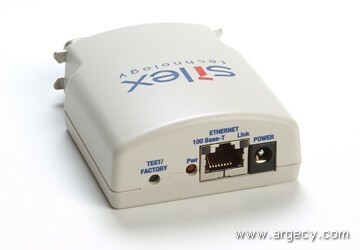 In addition, the SX-2933 provides IP access control list security, which allows you to restrict access to the printer based on the IP address of the sending computer. The SX-2933 can increase users productivity by shortening their print waiting times. Now IT managers can avoid buying a faster printer by fully utilizing their existing printer speeds. When it comes to printing graphics documents, with a throughput of nearly one megabyte per second, the PocketPro 100S can handle the toughest jobs in the shortest amount of time. The SX-2933 also supports numerous features for configuration flexibility, ease of use, and diaganostics.